RetroArch is a homebrew program that combines a ton of different gaming emulators into a single, relatively sleek package. Development on it began in 2010, with version 1.0 releasing in 2014. Several updates later, today the people behind it released the latest version, which can run on hacked Nintendo Switches. RetroArch isn’t the simplest homebrew program to set up. There are a lot of options to calibrate, in part because of everything it includes, both in terms of the different emulators it supports and all of the available settings. Once it’s running, its appeal comes from an interface that’s easy to navigate. In practice it’s very similar to the explorer bars on the PS3 and PSP homescreens, just filled with retro emulators and whatever games people stock them with. 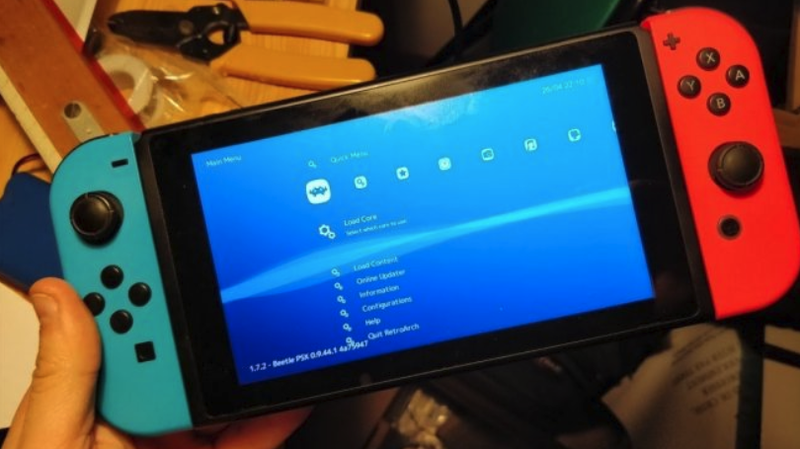 While originally popular on hacked PSPs, Vitas, and Raspberry Pis, the fact that RetroArch now works on hacked Switches opens up a whole new frontier. In addition to the features standard on the RetroArch, the Switch version includes touchscreen support and even peer-to-peer multiplayer. In addition, it supports split Joy-Cons, meaning in theory two people could play Ridge Racer together with each Joy-Con acting as an individual controller. Natinusala released a video alongside today’s RetroArch update to show The Legend of Zelda: Ocarina of Time running on Switch. Homebrew on the Switch took off earlier this year following the reveal of a hardware vulnerability in April that Nintendo allegedly wouldn’t be able to patch out. It was at the level of the Nvidia graphics chip the console uses, and as a result would require changes at the manufacturing level, meaning anyone with a Switch using the old chips could conceivably be able to jailbreak it at their leisure. Nintendo has been fighting back by allegedly banning the Nintendo accounts of users it suspects of piracy attempts or hacking online in games like Splatoon 2. When it comes to retro emulation, however, homebrew hackers have kept making progress. When Switch Online released a couple weeks ago, it didn’t take long for some people to find a way to upload their own NES ROMs to the app beyond the official ones. Nintendo did not immediately respond to a request for comment about the growing number of emulators operating on the Switch. RetroArch goes beyond just NES games, however, housing emulators for everything from the Game Boy and SNES to the Sega Genesis and PlayStation. Nintendo made waves when it announced that the Switch wouldn’t have a traditional virtual console for buying and playing its old games, which previous consoles had. For people with hacked Switches, RetroArch effectively offers that virtual console, only it’s not constrained just to Nintendo’s backlog. At the same time, while emulation tools are starting to take off on Switch, it’s unlikely to become rampant any time soon. Hacking Switches, even using the April exploit, remains complicated and always includes the risk of accidentally bricking the console. In addition, while individual bricked Switches can be replaced, getting your account banned by Nintendo isn’t so easily undone.